Some people just don’t like all the power those new, fancy consoles give them. They were satisfied happy with there old Atari 2600s. 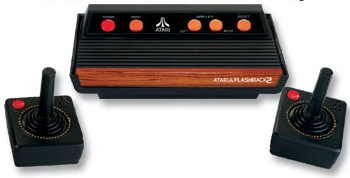 Well, you can be happy once again, just buy yourself an authentic Atari 2600, sans all those game cartridges. That’s right, you get all the retro action without having to store all those silly cartridges. It definitely looks retro, right down to the dark wooden panels and the terrible color scheme. You even get two of the class joystick controllers, with improved mechanics inside, of course. The included A/V cable (7 foot) will hook up to just about any TV. The AC adapter is also included. Adventure, Adventure II, Haunted House, Return To Haunted House, Secret Quest, Wizard, Asteroids, Asteroids Deluxe, Pong, Battlezone, Centipede, Lunar Lander, Millipede, Missle Command, Space Duel, Caverns of Mars, Quadrun, Saboteur, Space War, Yars’ Revenge, Yars Return, 3D Tic-Tac-Toe, Aquaventure, Climber, Combat, Combat 2, Dodge’em, Frog Pond, Hangman, Human Cannonball, Maze Craze, Off the Wall, Outlaw, Pitfall!, Radar Lock, River Raid, Save Mary, Video Checkers, and Video Chess. That’s quite the selection, and even if you won’t play 2/3 of them, there are some great ones in there, including Pong, Millipede, Asteroids (and the deluxe version), and Lunar Lander! You can once again enjoy Pong, Millipede, Asterodis, and whole lot more on the Atari Retro, and it’s a bargain, $50 from firstSTREET.